From a technical standpoint the NEC DT330 24D phone offers the same design and features as the other DT330 models (DT330 12D, DT330 32D and the DT330 DESI Less). From a technical standpoint the NEC DT330 24D phone offers the same design and features as the otherNEC DT330 digital series models (DT330 12D, DT330 32D and the DT330 Desi Less). The key difference between them is how many customisable one touch buttons are available. In the case of the DT 330 24D there are 24 keys. Each of these buttons can be customised to display phone lines, staff, speed dial numbers, systems functions etc. Accompanying the 24 buttons are multicoloured LED indicator lights that allow you to see at a glance by colour if they are busy or available. With 24 buttons this phone handset has been designed for managers, even reception staff in smaller companies with less than 24 staff. 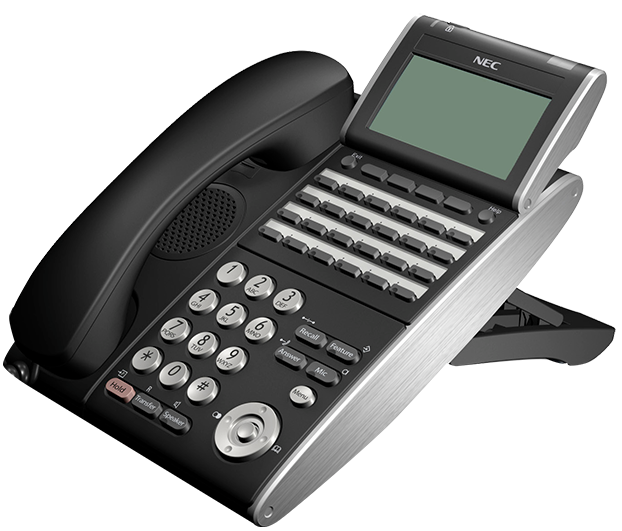 If you need more than 24 buttons you can always up spec to the NEC DT330 32D phone. The NEC DT330 24D handset is easy to use and intelligently designed. The reality is from a visual perspective it differs little from more traditional pbx handsets which is what customers are used to. Unlike the cheaper NEC DT310 6D phone the LCD screen is also backlit for easier viewing in all light conditions. Below the NEC DTL- 24D display screen there are also 4 intelligent contextual buttons. On the corresponding screen above they present logical options depending on what function you’re accessing on the handset. For example, if you are retrieving voicemail it will show options like replay, delete, save etc. The logic is intuitive and makes daily phone use with the 24D much easier. To the right of the context keys is also a help button. Why more manufactures don’t do this completely escapes us. It’s like having your handset user guide in the handset and available at all times. For new staff, or if you just have a simple query it is a wonderful feature to have readily available. The NEC DT330 24D handset also has a silver jog dial/ navigator button that’s located on the bottom right of the handset console. This provides for quick and easy access to features like redial, system speed dials, system directories and more. If you have staff that continually call key suppliers or customers they may even want to program some of the 24 available buttons with these contact numbers for even quicker one touch direct access. The call quality on the NEC DTL-24D phone is excellent as is the full duplex hands free speakerphone. Full duplex allows for awesome speech quality on hands free conference calls and acts the same as expensive Polycom conference phone solutions. Unless you have a dedicated conference room the quality is better than adequate. The NEC UNIVERGE SV8000 telephone system series are all hybrid which means you can connect not just phone handsets but also IP. Digital handsets are cheaper but there are specific benefits to IP that may be useful. For example if you have remote workers, staff that hot desk, XML applications or have limited cabling available for 2 ports per desk for PC and computer (IP only uses one). You don’t need to use all IP or all digital – you can mix and match for the optimum outcome and maximum savings. If you are looking for an equivalent VoIP handsets then check out the DT730 24D IP phone. Another benefit of IP handsets is they don’t require system programming. If you plug an IP handset into a live port it will automatically register once you’ve logged in. It then carries forward all your personalised settings and even you extension number. This makes staff moves very easy indeed. By comparison a phone handset needs the ports swapped at the pbx or alternatively needs to be reprogrammed for the new extension. The NEC DT330 24D digital phone is easy to use with the 24 customisable buttons, intelligent and feature rich and is a very good handset for daily power users. Infiniti Telecommunications is not affiliated with the manufacturer of this product in any way. Looking to learn more about NEC DT330 DTL-24D Digital Phone Handset?